Cast: Tom Hardy, Tom Hardy, Emily Browning, Christopher Eccleston, David Thewlis, Taron Egerton. Synopsis: An account of the lives of the Kray twins, at the height of their criminal empire in the East End of London in the 1960s. Review: Ask anyone in England about the Kray twins, and you’re probably going to get a less than positive reaction, and for good reason. It is no secret that both Ronnie and Reggie Kray were nasty pieces of work. So when choosing to make a film about the lives of two violent and dangerous gangsters who were arguably at the top of the criminal underworld, and the celebrity stage in the 1960s. It begs the question, who do you cast as two of the most evil men in twentieth century England? You get the very popular Tom Hardy, of course and get him to double up as both of the Kray brothers in a remarkable performance. You may think that since one man is doubling up as both brothers that they’re unlikely to share screen time together, well director Brian Helgeland manages to pull off this, and in some considerable style. They don’t just share screen time, oh no. They bicker and squabble too, sometimes with other people and sometimes with each other and the fists come out! It’s Bane VS Max Rockatansky set in 20th century England! It is very clear that these are two men who although they may look alike and share many similar traits, and a last name. They are ultimately two different people and Hardy’s performances show the difference between the two. Reggie the charming ladies man of sorts, with Ronnie being the more dark and dangerous of the two brothers, like a bomb that could go off at any second. The tale of these two brothers is told through the eyes of the young, innocent Frances (Emily Browning) who falls for Reggie. Her sweet and innocent character is ultimately what draws Reggie to her, before she witnesses the dark and dangerous underworld as she becomes his girlfriend and later wife. It’s through her perspective that we watch as the two brothers rise up through the criminal ranks and see their empire expand into something vast and substantial. Whilst at the same time, the criminal lifestyle ebbs away at Frances and the love she strongly displayed for her husband in the early years, quickly breaks down as their relationship crumbles. Hardy shines as both brothers but it is portrayal of Reggie that definitely seeks to tug at the audiences’ heartstrings as he seeks to try and build a life away from the criminal hive with Frances. It is the crazy actions of Ronnie that drive a firm wedge between Reggie and Frances and causes friction between the two brothers. Emily Browning also gives a very strong performance as Frances, although the material she was given is often a bit lacking at times and there was a lot more to be explored with her character, leaving her somewhat underdeveloped. In addition the rest of the principal cast also feel somewhat underutilised, but the focal point of the film is on our leading men. For a film about two very sinister men, there is a surprising amount of humour involved. The humour works, but it does not hide the sinister nature of the trade of the Krays. Though Reggie tried to be a ladies man and compassionate towards his wife, it is ultimately in vain. 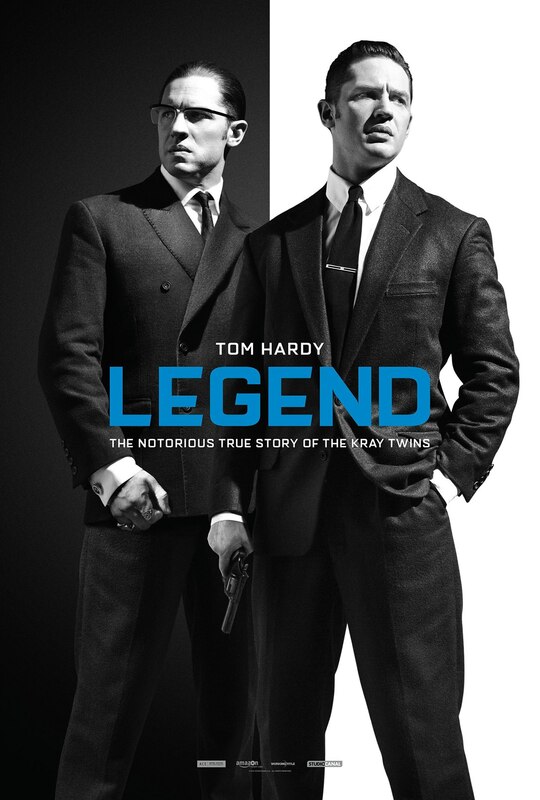 The film of the title ultimately rings true, the tale of Ronnie and Reggie Kray is one of legend, a dark and murky legend that has become firmly entrenched in 20th century British history, and one that is not going to go away any time soon. Although the script does lack in places, and the rest of the cast feel really criminally underdeveloped, Tom Hardy is brilliant and award worthy in two mesmerising leading performances.